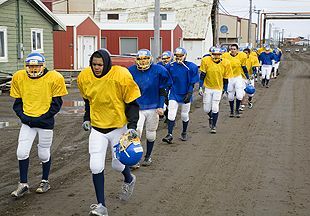 Editor's note: This is Part 1 of ESPN.com's series on high school football in Barrow, Alaska. To read Part 2: On Top Of The World. BARROW, Alaska  Standing on the sidelines, looking across the high school football field, it all seems normal. The zebra-striped officials, the screaming parents, the face-painted cheerleaders. But normal? This is anything but. Four of the six officials are working their first game. The calendar says it's the middle of August, but snow flurries fill the air. 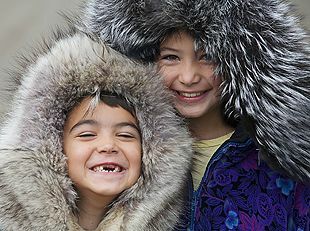 While the cheerleaders drape themselves in blankets, the parents and children wear sealskin and caribou parkas. The goalposts are made of spray-painted sprinkler pipe. The benches are tipped-over telephone poles. School buses double as locker rooms. The massive body of water that's a touchdown pass away? The Arctic Ocean. And the uninvited guests every fan is watching for? Polar bears. Welcome to the top of the world, home of the Barrow Whalers, the one and only Arctic high school football team in America. Here, 330 miles north of the Arctic Circle, at the very top of our country's 49th state, a place with no grass, no trees, but plenty of permafrost (snow and ice covers the landscape eight months a year), school superintendent Trent Blankenship controversially brought America's most popular sport to town this year. And no one is quite sure what to think. Of the 44 Eskimo, Tongan, Samoan, Asian-American, African-American and Caucasian teenagers who signed up for this experiment, only four had ever played organized football before. Now, nearly a quarter of the school plays. They play, the kids tell you, because it's something to do, something besides roaming the snow- and mud-covered streets looking for a snowmobile to send off a cliff. They play, the adults insist, to save the future of a town plagued by substance abuse and escalating high school dropout rates. And they play, the critics argue, because it's what Trent Blankenship wants. "Whether or not it's a good idea, that's not up to me," says running back Quinton Carroll, who is part Eskimo. "If they're going to have a football team and give us the opportunity to play, I'm going to play. And then people can see, even though we're up at the top of the world, we have football like everybody else." But at 71 degrees 18 minutes north latitude, this place is unlike anywhere else. Barrow, the seat for the 88,000-square-mile North Slope Borough, is the northernmost settlement in the United States and one of the northernmost towns in the world. 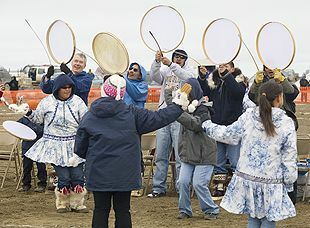 It's a place that snowy owls, arctic foxes and 4,600 people  more than half of whom are native Inupiat Eskimo  call home. The discovery of oil in nearby Prudhoe Bay in the late 1960s brought millions of dollars to this once-poor region and with the money came all the modern amenities  and plagues  of the 21st century. Drive by almost any home on Barrow's muddied streets and the town's overnight evolution smacks you in the face. Four caribou heads sitting on a banquet table beside a shiny red ATV. A rug of polar bear skin draped across a snowmobile in a backyard. Three middle school kids climbing over a scattering of caribou antlers to run inside and play Xbox. But more money has also meant more problems. Parents uninvolved in the lives of their kids. Unmotivated kids who couldn't care less about school. As North Slope Borough mayor Edward Itta sees it, this secluded Arctic town that was once built on Eskimo values like sharing and cooperation has devolved into a greed-driven world where money is king. "The growth has been dramatic  and traumatic," Itta says. "In many ways, it's a place that's grown up too fast." Football, some believe, is the answer. 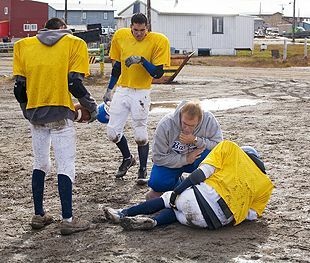 Football, they say, can keep kids out of trouble, teach principles like discipline and teamwork and bring the community together, helping a modern-day Barrow reconnect with its values-rich past. To others, the concept is laughable. Critics look at a cost of nearly $200,000, logistical headaches like flying every opposing team into town or squeezing three road games into one 3,682-mile, six-day road trip, and they wonder if high school football really belongs in the land of the polar bear. "I don't think it fits here," says middle school teacher Lynn Lacey. "I don't think this is a long-lasting thing. There's simply not enough history and background with football  the kids don't watch it, they don't know it. It's nothing more than a flashy way to get headlines and waste money." In the middle of August, the Arctic looks nothing like you'd imagine. There's no snow, no ice and typically no polar bears. The ice pack that shoves itself against Barrow's shoreline nine months a year has retreated a mile or so out to sea, where it is barely visible on the horizon. Soon, when the winds shift and the fall freeze takes hold, the ice will return, stretching Barrow's end-of-the-world shore some seven miles farther over the Arctic Ocean. But for now, the temperature is in the 20s, the sun is shining brightly and 44 high school teenagers  the majority of whom are wearing shorts  gather on a gravel field for the final practice before their first game. No. 67, the linebacker with the square jaw and crooked demeanor, can't stand still. He kicks rocks at his teammates between plays. He rolls his eyes when coaches order him to stop. When he's told not to tackle his teammates, he flattens them. When he's told to run full speed, he jogs. And this is the only player with varsity experience. His name is Kilifi Fotukava and he's the poster boy for the type of kid so many believe football can help. Since his mother sent him from Anchorage to Barrow three years ago to live with his aunt, Fotukava has been in trouble for everything from inappropriate behavior toward female students to bringing a weapon to school. "I don't know why I act the way I do," Fotukava says. "I guess it's just the way I am." But he loves football. Lives for hitting people. So his family, his teachers, his classmates and even Fotukava himself hope the sport can change the way he is. "My thing is that I don't want to see him on the front page of the paper going to prison and getting lost in the system," says Fotukava's aunt, Anna Manu. "Or worse yet, I don't want to open the paper and see that he is dead. Football is something that he looks forward to. It helps motivate him to do his homework and stay in class." On this day in practice, offensive line coach Brian Houston tears into Fotukava for kicking rocks at his teammates and disrupting the huddle. "Kilifi, you gotta quit messing around," Houston says. "Take pride in your huddle. C'mon, now. This is where you come together as a unit. Cut all this other stuff out." Head coach Mark Voss, the man with the raspy, deep voice that sends shudders down the spines of his middle school computer class students, misses the discussion altogether. He already has plenty to worry about. In April, when he got the e-mail from Superintendent Blankenship asking if any of the teachers on staff had football coaching experience, the man who last coached 23 years and 5,000 miles ago in Arkansas laughed. "I thought it was a joke," Voss says. "Football? Up here?" Little did he know what he was getting into. Forty kids showed up for the first meeting, asking questions like, "Where are we going to play?" "Who are we going to play?" and "Is this tackle football?" "You could sense their desire," Voss says. "For all the questions these guys had  and they were all good questions  you could tell they wanted to play." If only it were that simple. If only Barrow were like any other high school in the country and Voss could prey on that teenage exuberance and roll out a few footballs, toss out some gear, instill some discipline and then cross his fingers and hope that no one gets hurt. But this is the Arctic. The footballs, the shoulder pads, the tackling dummies, they have to be ordered from an athletic supplier in the Lower 48 and shipped in on one of the two daily Alaska Airlines flights from Anchorage. Outfitting each player from head to toe  including jerseys, pads, Under Armour and hand warmers  costs the district about $400 per player. And delivery isn't exactly guaranteed. Don Dunbar, the director of purchasing for the school district, waited three weeks for a case of athletic field marking paint to show up for the first game. It did arrive  two days too late. "Welcome to the Arctic," Dunbar says, "where express overnight delivery means five days." Because of its remote, island-on-the-mainland location, finding opponents isn't easy. 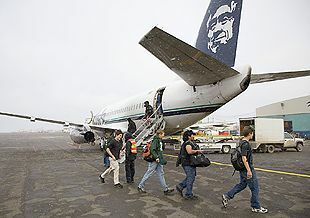 Every home opponent  be it Delta 450 miles away or Sitka 1,400 miles away  has to be flown to Barrow. That means providing flights to the visiting team, plus ground transportation, meals and a place to sleep. It all adds up to roughly $20,000 in expenses for each home game. When the Whalers hit the road, they're the ones hopping in a plane, sleeping in a gym and eating fast-food pizza. "The logistics boggle your mind," Voss says. "They keep me from sleeping at night. When you think of a high school football program that has to deal with the things we do, it blows you away. But our cross-country (team) deals with it, our basketball deals with it, our wrestlers deal with it. Football is just one more layer." The field where the team plays is a glorified gravel pit, a plot of land the corporation uses to operate heavy machinery in the winter and dry gravel in the summer. The lines on the field are a combination of field paint and flour, which seagulls swarm around and eat after each game. 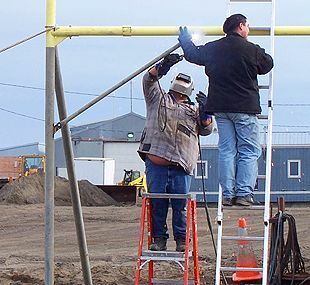 Since the permafrost can't hold a 1,000-pound structure without truckloads of cement, which the school district can't pour into a temporary field, the goalposts sit above ground. They were built by an Inupiat man named "Moosie," who had never watched a football game before in his life. Using drawings given to him by his boss, he built the structures out of spare sprinkler pipe he found in the district maintenance shed. "I just had to read the blueprints, look at all the material we had and just start cutting and welding it together," he says. "It wasn't too difficult." The referee for the opening game is a state trooper. 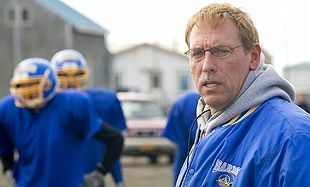 Bill Broderson was escorting a prisoner to Fairbanks, Alaska, when he overheard talk about high school football coming to Barrow. A few phone calls later and the longtime high school official had his first-ever job in the Arctic. To fill out the rest of his six-man crew, he advertised on KBRW, the only radio station in town. Of the assorted group of teachers, baggage handlers and secretaries who responded, only one had any experience. Two were related to players on the team. An Inupiat woman, who had never watched a football game in her life, simply wanted to be part of the first game in the Arctic. They all were hired. "I pretty much threw them the rulebooks and said, 'Here you go  ask me some questions,'" Broderson says. "When we walked on the field, they looked scared. Absolutely petrified. But what else would you expect? There aren't exactly a ton of officials running around up here. There's no blueprint for starting a football team in the Arctic." When the temperatures begin to fall into the teens and the ice pack returns to shore, so, too, will Barrow's most feared winter visitors  polar bears. But on this mid-August afternoon, even though the ice pack is out at sea, three of the creatures have swum the seven miles to shore to stroll through town in search of food. Word spreads like a bitter wind blowing off the Arctic. Voss is sitting at his desk when he gets an e-mail from a concerned parent, wondering what the team is going to do if a bear shows up at practice. One bear has been spotted less than a mile from the field. "I don't know what they want me to say," Voss says. "We'll gather the team up, get on the school bus and wait for the bear to leave. Then once it does, get back out there and continue practice. The bear isn't going to come messing with the bus." In Barrow, dealing with bears is just part of everyday life, a life that on the surface, seems incredibly basic  one gas station, one radio station, two grocery stores, no paved roads. But surviving in one of the harshest environments in the world is physically, mentally and financially taxing. Here, the sun won't set for 84 straight nights. In the winter, it won't rise for 67 straight mornings. There are no roads in or out of town, meaning that every single piece of everything  from people to pizzas to shoulder pads  needs to be flown in or shipped on the barge that arrives from Seattle once a summer. According to the North Slope Borough Planning Department, the cost of living in Barrow is approximately 278 percent higher than the cost of living in the lower-48 states and 214 percent higher than in Anchorage, Alaska's largest city. A sampling shows a gallon of milk costs $8, a case of Powerade $35, a bottle of saline solution $16. Part of that is the town's remote location. Part of it is astronomical winter heating costs. Even on a sun-splashed late-summer afternoon, signs of the cold to come are everywhere. The windshield of every car is cracked, its glass unable to withstand the frigid temperatures of winters past. Every grille has an electrical plug hanging from it to keep engine blocks warm. And every building is constructed on stilts so that when summer temperatures climb into the 40s and 50s and the top layer of permafrost melts, the foundation doesn't sink into the ground. "When you're the tallest thing walking around on the streets and the wind is blowing off the Arctic Ocean at about 60, 70 miles an hour, it hits you pretty hard," says PJ Ford Slack, a former school administrator in Barrow. "It feels like little ice knives going through you." There isn't much for kids to do. The local recreation department does its part, with a roller rink, rock-climbing wall, basketball gym and a pair of teen centers, but there's no movie theater, no mall, no place to hang out. So why live here? The natives say it's what they know. Archeological digs suggest that Inupiat Eskimos lived here as far back as 500 A.D., hunting caribou, polar bears and the whale, just as the native population  60 percent of the total population  still does today. For the others, it's opportunity  a job, a promotion, some extra money. While the average starting salary for a teacher in Alabama is $25,000 a year, a first-year teacher in Barrow is paid close to $50,000 in an effort to bring quality educators to the area. In recent years, the financial picture has darkened. Oil production in Prudhoe Bay has begun to slow, meaning smaller dividend checks, fewer jobs and more government cutbacks. The uncertain future  for adolescents and adults alike  has culminated in an escalating drug and alcohol problem. Broderson, the state trooper, estimates that 98 percent of the criminals he transports can trace their troubles to substance abuse. Fotukava appears to be one of the kids headed down that track. "If having a football team can keep one kid from ever having to meet me, it's worth it," Broderson says. "I can't think of a better, legal, encouraged avenue for these kids to take out all that pent up aggression than playing football." The 44 high school football players in their brand-new helmets, brand-new shoulder pads, brand-new football pants and brand-new jerseys, squeeze into the vinyl seats of the antiquated school bus and listen for the final instructions before their first game of the season. When their coaches finish the clichés about playing hard, having fun and leaving it all on the field, assistant coach Jeremy Arnhart steps forward. "Guys," he says, "this is simple. Just play like you know how." Only these 44 don't know how. When they step off the bus and onto the gravel-covered field, it will be the first time most of them have ever stood on a field with lines. It was just three weeks ago that this group started practice. Three weeks ago that Coach Voss first issued equipment, piece by piece, hoping to ease the transition from the touch football these kids had played on the tundra to the hard-hitting, full-contact, the-whole-town-is-watching real thing. "I thought I knew football," says Jake Voss, a senior tight end and Mark's son. "But when I started watching the game, looking at coverages and responsibilities, I realized real quickly: I didn't know a damn thing." The 15 practices have been a brain-numbing cram session, with Voss and his coaching staff teaching everything from how to tackle to how to put on pads. "We had one kid who put his pads on upside down," Voss says. "But we got it corrected." In this final walk-through before the first game, Voss runs through all the details any sensible coach would, reminding his kids to get a good night sleep, stay out of trouble and eat a healthy breakfast in the morning. Voss has a quiet confidence about him. And for good reason. He has done all this before. At his last coaching job, 23 years ago in Arkansas, he helped start a program from scratch. And after three weeks of practice, he says, this team could beat that team. But that confidence quickly evaporates in the season opener. 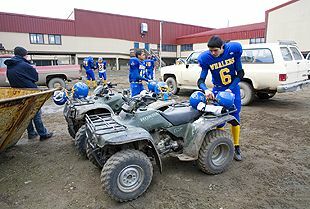 Though nearly half the town shows up for the game, surrounding the field with pick-up trucks, ATVs and even recliners, the Whalers are plagued by nine procedural penalties, including four false starts by Fotukava alone. They lose their opener to Delta, a school that has played football for just three years, 34-0. The next week against Valdez, there's improvement. The Whalers graduate to the next level of football blunders. A ball hits a Barrow punt returner in the leg and is returned for a touchdown. Fotukava throws an interception on a botched punt, and it, too, is returned for a touchdown. Valdez defeats Barrow, 33-0. Two games into the season, the Whalers have been outscored, 67-0. They have yet to find the end zone. And just one home game remains against Sitka before the team's three-games-in-six-days road trip. But there's a glimmer of hope. Standing at midfield talking to Voss after the game, one of the Valdez coaches says, "If your kids play as hard as they did today against us, you'll have a shot against Sitka." That's all Voss needs to hear. Thinking back to that first season in Arkansas, he knows how difficult this can be. Now he's got something to help push his players. "It can be heartbreaking," he tells them. "Absolutely heartbreaking. But all that pain, all those difficult days in practice, it's all erased by winning that one game. You win that one game, you have that one day where everyone comes together and everything clicks, and they will never take that away from you." The following week, they'll get their next chance. Video editing by Paul Desjarlais/Roadside Entertainment. Video shot by John Tipton. Sound by Morgan Worth. Video produced by Nik Kleinberg. Paved roads are nonexistent in Barrow, so the 10-minute walk to practice can be a bumpy one. In a town with no movie theater or shopping mall, football might keep Barrow students out of trouble. Just trying to play a game in the Arctic created interesting challenges. The field is temporary, so cement couldn't be poured to hold regular 1,000-pound goalposts. Instead, "Moosie" Igtanloc, left, built them out of spare sprinkler pipe. The Whalers' home field is a glorified gravel pit, a plot of land used to operate heavy machinery in the winter and to dry gravel in the summer. Coach Mark Voss has to worry about the game plan ... and what to do if a polar bear appears at practice. Injuries from playing on the rough "turf" pose another challenge for Voss' team. Forget August heat. 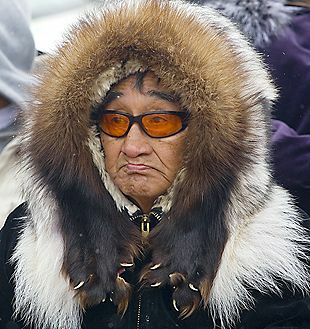 North of the Arctic Circle, fans donned sealskin and wolverine parkas to watch the school's first game. Why live in such an inhospitable place? Because it's home. 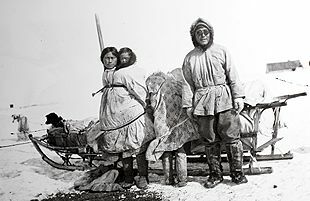 While pickup trucks and ATVs mostly have replaced dog-sled teams, archeological evidence indicates Inupiat Eskimos lived in the Arctic in 500 A.D.
Learning to gear up was a new experience for the players. "Very few of them were able to understand exactly how the knee pad went in," Voss says. Kilifi Fotukava, left, is one of the teens Barrow hopes to reach with football. His aunt hopes it's enough to keep him out of jail  or worse. With no locker room to call home, the Whalers relax in a school hallway before their first game. 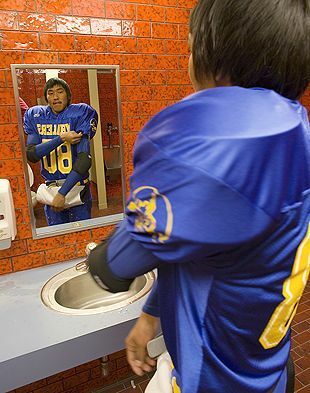 Joe Skin adjusts his uniform in a bathroom mirror. The Whalers dress in classrooms for their home games. Every opponent must be flown to Barrow. Add in ground transportation, meals and a place to sleep, and the tab runs around $20,000 for each home game. 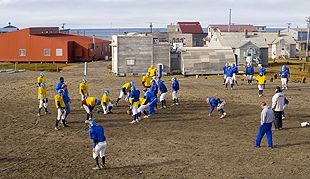 The players were pumped up for the northernmost organized football game ever played. How cold can it get? "Sometimes, you can't feel your toes," says Amao Sweeney, left, with older sister Caitlin, before the game in August. How do you get a "skybox" in Barrow? Erect a plywood enclosure atop your truck and you'll have the best seat in the house. 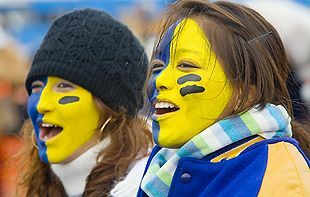 With faces painted in Whaler colors of blue and gold, cheerleaders were making their debut, as well. Native dancing provided the inaugural halftime entertainment. The Whalers' first two games weren't pretty. The players committed rookie procedural penalties, and turnovers proved costly.